2014 has been a successful year for ShopVisible merchants so far, as new data from the company’s Influence & Impact report reveals that overall traffic to merchants on the platform has grown by 9 percent. In addition to the increase in site traffic, the report found that 67 percent of site visits came from new visitors. 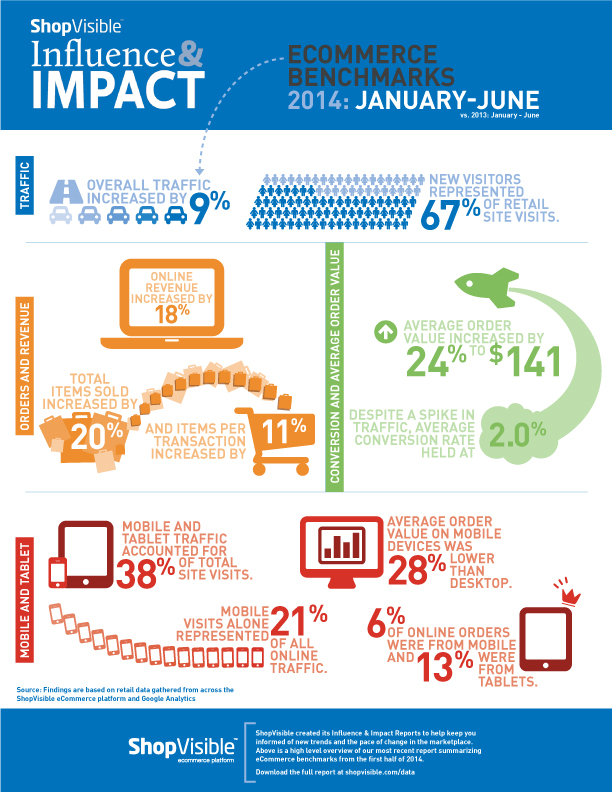 Furthermore, mobile traffic continued to increase in the first half of 2014, making up 38 percent of all site traffic for ShopVisible merchants. Comparatively, ShopVisible’s 2013 Influence & Impact report found that just 30 percent of site traffic came from mobile devices. The increase in mobile traffic, however, only led to a slight increase in mobile conversions. For example, 4 percent of orders came from mobile phones and 11 percent came from tablets in 2013. In 2014, 6 percent of orders came from mobile phones and 13 percent came from tablets. Plus, the average order value on mobile devices is 28 percent lower that it is on desktops. This data suggests that consumers are leveraging their mobile devices to browse, yet most still complete their transactions on traditional desktops. It is also important to note that the report shows ShopVisible merchants have seen an increase of 18 percent in online revenue in the first half of 2014, with a 42 percent increase alone in the month of June. Moreover, merchants have seen a 20 percent increase in total items sold and an 11 percent increase in items per transaction. According to the company, the increase in online revenue is attributed to data-driven merchandising and site optimization strategies implemented by merchants.